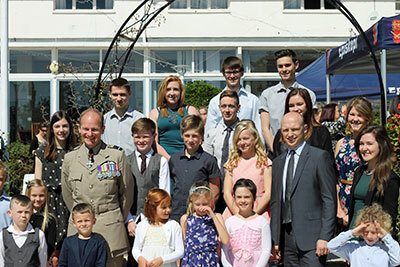 THE newly-appointed Commander British Forces Cyprus, Air Vice-Marshal Wigston, has opened the fourth annual Young Achievers Awards in British Forces Cyprus (BFC) at a ceremony hosted by SSAFA. The awards scheme has been running since 2011 and acknowledges the achievements of 5-18-year-olds who have made an important contribution to their community, as well as those who have given hope and encouragement to others. At the end of 2014, parents, teachers, youth workers and health professionals in BFC were invited to put forward their award nominations for 23 individual awards and one group prize. The awards were presented by retired England Rugby Union player Matt Dawson, who was appointed as an ambassador for awards sponsor Sodexo in 2010 to help raise awareness of health and well-being issues. SSAFA thanked those who nominated the young achievers and all those who ensured that the event was a success. Special thanks and congratulations also went to the Young Achiever Award winners for their outstanding achievements and contributions to the BFC community.